Bathroom Vanities and Accessories Design and Tips | DecorPlanet.com Blog: What sets a faucet's finish apart from other models? 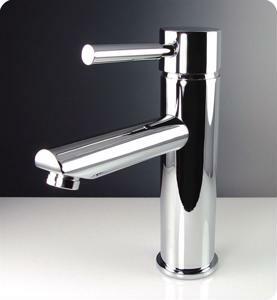 What sets a faucet's finish apart from other models? As you begin your bathroom remodeling project, one thing will become abundantly clear - there are way more bathroom accessories on the market than ever before. Choosing the right faucet for your washroom will be a pivotal decision, but knowing a few prerequisites will make shopping for one much easier, according to The Daily Harrison. Before you start choosing a finish for your faucet, you should first look into the area where it will be mounted. Whether you're purchasing a new bathroom vanity or installing a faucet into an existing piece, you'll need to know which faucet and dials will work with your setup. One of the most common finishes is chrome and it is the least expensive, while polished or brushed nickel will cost a bit more. Nickel brings a bit more warmth to a space than chrome, but if you're really looking for a piece that will add a cozy touch, bronze has become a huge trend that designers are buying in droves. There are countless options to choose from when shopping for faucets for your washroom, so which one speaks to your design tastes?